Hello lovelies! I am excited to share a secret with you today. Are you ready for it? Well contrary to what you may think, I am not always a momma who loves being in the kitchen. Sometimes life gets crazy. Between homeschooling, dishes, laundry, normal household chores, and wrangling two redheads, the last thing I want to do is strike up the oven and cook dinner. Well when I get in that mood, I have a little thing I do. The littles happily have corn dogs or mac n' cheese, while the hubbs and I share something else. Sometimes we even wait for when the littles have gone to sleep. We heat up something yummy for us and put on a movie. It is like a little date night at home. I love it! Well that being said, T.G.I. 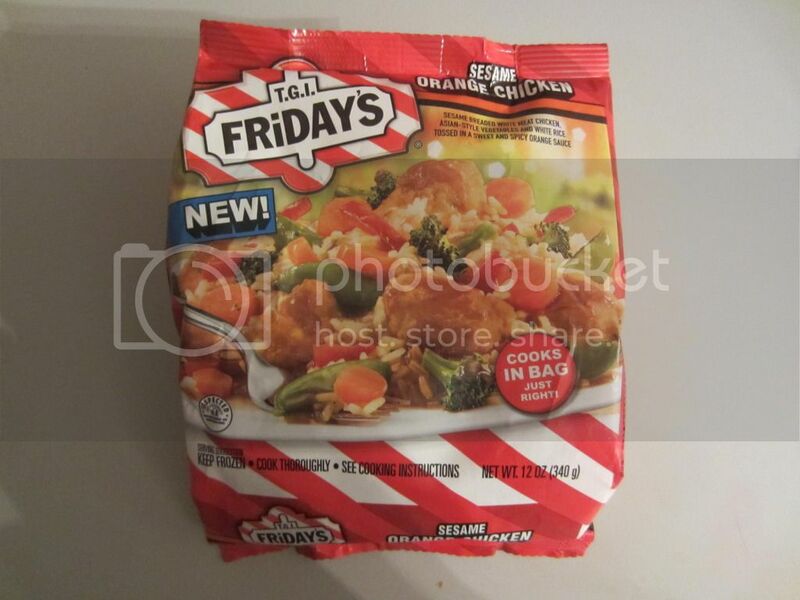 Fridays has come out with a fabulous new line of T.G.I. FRiDAY’S “Entrées for One”. These meals are simple to cook. You just pop them in the in the microwave, in the original bag, and in just a few minutes you have a yummy meal for you. It's so easy that the Hubbs could even make dinner for me. That is a real nice change! I personally love the sesame orange chicken. We added some rice, from our rice cooker, and then we had enough to share. Now if you are thinking "when else could I use an entree for one" let me tell you. These are perfect for when the hubby is going solo for dinner. I can't leave for a girls night without him being taken care of, and these are simple and easy for him to pop in himself. Hubbs likes things easy. The microwave and him are like buds when it comes to cooking. Since T.G.I. Fridays is just now doing the launch for these fabulous new goodies, they are having a contest. You can go onto their facebook page and enter to win some awesome cool prizes. They even have a Fun Freezer contest . Click here to see the finalists. So T.G.I. Friday's are awesome, quick meals for you or your hubby. These would be great to keep stocked in your fridge. They have a great selection of delicious meals. Hope you and the hubbs get a night off, or heck give yourself a night off and watch a chickflick while eating some yumminess. I think us Mommas enjoy a night of with our sweets every now and then. Don't you? I love those TGI fridays meals!